Foster + Partners–designed Apple store coming to Carnegie Library in D.C. - Archpaper.com Foster + Partners–designed Apple store coming to Carnegie Library in D.C.
Last year, Events DC (the capital’s convention and sports authority) and Apple filed a letter of intent to lease portions of the 63,000-square-foot library. An Apple store will be realized in the Carnegie Library at Mount Vernon Square, Washington, D.C. after plans were approved by the District’s Historic Preservation Review Board (HPRB) last week. 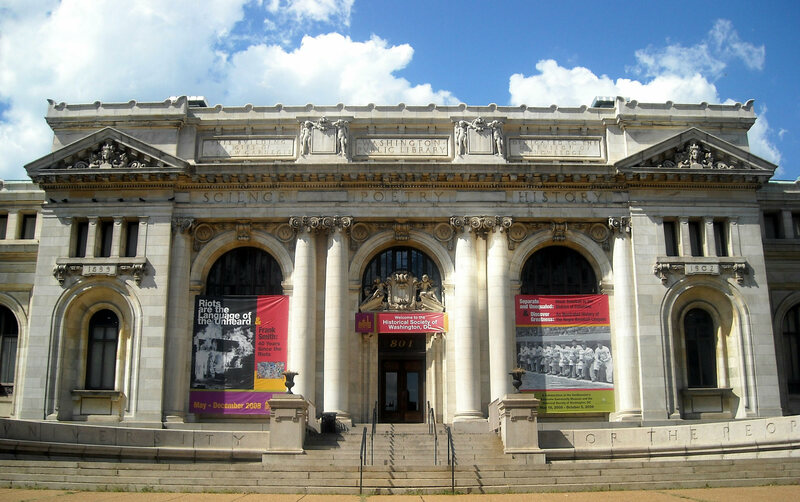 Last year, Events DC (the capital’s convention and sports authority) and Apple filed a letter of intent to lease portions of the 63,000-square-foot historic library. That now-approved plan includes restoring the exterior and retrofitting the interior to create retail, office, and exhibit spaces. Apple’s store will be designed by London-based Foster + Partners and the restoration efforts will be undertaken by New York–based Beyer Blinder Belle. Alterations already made to the neoclassical library, including a rooftop over the original skylight and the conversion of a reading room into a theater, will be reversed as part of the restoration process. The north elevation of the building will see a grander, rounded staircase replacing its current one, and a central pillar will be removed to enlarge the entryway and make space for a glass entrance. Other changes include the removal of the partitions in the library’s stacks and the original lay-lights in the Great Hall ceiling to create an atrium. Some of the proposed additions, mainly concerning 12 exterior banners fixed to the facade, are under revision for the quantity and size of the signage. “This new space, which will feature a massive video screen, new wall openings on both levels, and circulation ‘bridges’ connecting the upper floors, will significantly alter the historic layout and character of the interior,” a report from Historic Preservation Office (HPO) stated in Urban Turf. The current arrangement allows Apple to ‘co-locate’ in the library with the existing tenant, The Historical Society of Washington. Events DC will be able to use non-retail areas for special events. The building was constructed in 1903 and designed by Ackerman & Ross in the Beaux Arts Style; it was added to the National Register of Historic Places in 1969. Apple Beyer Blinder Belle Foster + Partners Historic Preservation Washington, D.C.